Doing the following will void the warranty of your camera and also might destroy your camera, although I don't think that should happen. If this is OK with you, please read on! A network adapter will be handy for a camera if you intend to take a lot of pictures from the same position indoors, for example if you are shooting a puppet animation or taking time-lapse shots of a rotting loaf of bread. 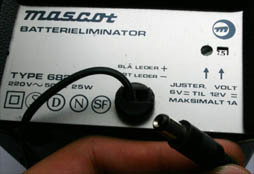 A Canon AC adapter for EOS 300D costs about 50 EUR. A battery costs about 5 EUR. So it makes sense to make an AC adapter out of a battery and save some money. 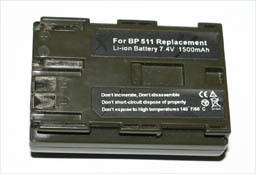 So buy the cheapest BP-511 battery that you can find and follow as described. You will need a BP-511 battery, a power cable, optionally a connector for the power cable, and a power supply in the range of 8-10 V DC. And of course some tools like a soldering iron, a sturdy knife and some glue. It is better to start with an un-charged battery so that any short circuits will not lead to damage to the cells. 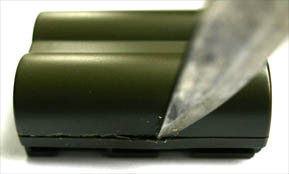 Open the battery with a sturdy knife by pressing the knife inwards-downwards through the gap between the two sides. Be careful not to puncture the cells. Once you are done with half of the job, the rest may come off simply by a bit of force. 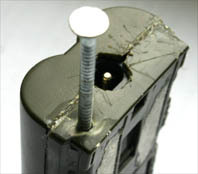 Use a soldering iron to disconnect the electrical connections by which the cells and the circuit board are attached to the enclosure. Now you have the battery enclosure ready to take in your wirings instead of the cells. 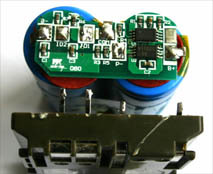 Just connect the + and - of the empty battery to the + and - of the power supply, preferrably with the help of an added connector at the outer end of the battery enclosure. 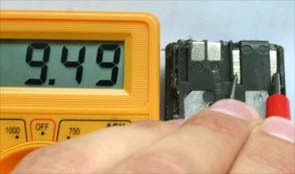 Check the polarity of your power supply and solder the wirings accordingly. I happened to have a connector that fit my powersupply handy so I used that. 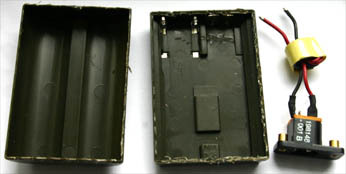 Once you are done with the soldering, check once more the polarity with the power supply turned on, and proceed to glue the parts and the upper half of the enclosure in place. Engulf everything inside the enclosure in glue. I used heat glue but the heat seems to soften and bend the plastic enclosure, so you may wish to use some other sort, or apply the glue more carefully. Also try to avoid spilling the glue on the outside of the enclosure. Pay special attention to keep the electrical connection rails clean. At this point I noticed that the closed lid of the battery slot presses a small button that reports the camera that everything is OK. But while there is a cable sticking out from inside, the lid cannot close. So also the adapter must be adapted to press this button. I did this by adding a nail, removing its head and bending it so that it reaches the tiny button on the body of the camera. Some more glue will fix the nail in place so that it does not rotate. 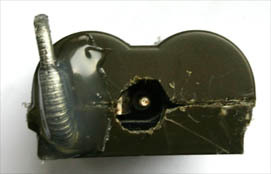 A nail is added, and bent so that it presses a button on the camera body. The voltage of the power supply that I am using can be adjusted, and I ended up at 9.5 V so that the camera will not think that the battery is running out, which was a problem at 7.5 V.
Finished! 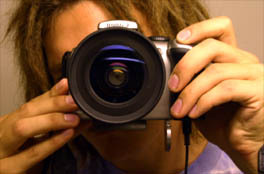 The adapter is just inserted into the camera and the camera is turned on and used normally. A bathroom mirror shot with the power cable and the open battery compartment lid visible. Hello and thanks for the tip on how to run my Camera from an external power source. I just wanted to point out somthing I found on my 300D. 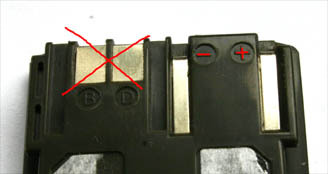 Just below the hinge of the battery door on the front side of the camera is a small square rubber cap that can be removed. 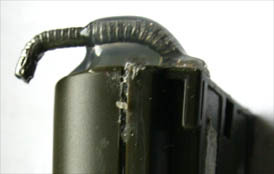 You can then make a small hole in the dummy battery at the point where its says Canon. You make the hole on the letter C of Canon. Now you can pass a wire with a socket on it though this hole and slot in the camera. Now you have No need to make that nail thing to press the cover pin. You will now be able to close the batter cover nice a neat and still be able to mount your camera on a tripod. did this to mine and it works great! I still thank you for your web page as it got me started and allowed me to find this little improvement..
You can make a wire protude by the lower side of the battery instead of letting the battery compartement open. 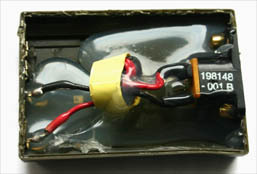 There is a tiny rubber lid near the battery cover, it makes a perfect exit for a wire directly connected inside the fake battery. Its what I did though. Nice tutorial, it helped me. Dang, I didnt see the comment before… ho well. Hello! That’s a good idea. why not? It is worthwhile in any case and that is also environmentally friendly. Thanks for the tip! Just a guess. :) Generally, manufacturers don’t like 3rd party batteries and stuff. 9.5V makes me feel good. 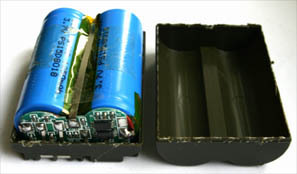 I am thinking of using a 12V 7Ah SLA battery,by cutting down volts. Not sure if the 1.3A would be good or not. Nishandh, that should work. You can use a LM7809 voltage regulator (pretty common) and a capacitor (200 μF 25 V perhaps) to stabilize the voltage. I used a crude system for testing. 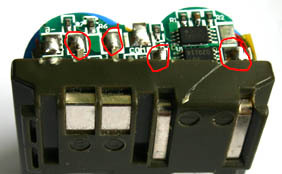 A series of IN5048 diodes (3A capable) to cut down the voltage. Getting the LM7809 setup soon. The current reads around 1A when continuosly fired using an AC adaptor. But for some reason, the Camera shows battery depleted icon, as soon as I touch the shutter button. Even with 10V across camera. Going to experiment with Vehicle batteries now. It looks like the UPS batteries used, are not capable of providing the peak power bursts. or something is wrong with what I am doing. Would update. Thankyou for the sugestions. I know it is an old link but in case some one can help, please respond. For my EOS 40D, which uses the same battery as the one described here I made a dummy battery. 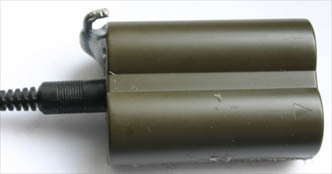 The original battery is rated at 7.4 volt. The body of the camera at bottom says8.1 volt. The original dummy battery and ac converter that is sold by Canon for this camera is 8.1v 2Amp. So I am assuming a 2Amp 8.1 volt power supply should be adequate to run this camera. OK, so I made my dummy battery. Inserted it in the camera. Checked it out with multimeter that the connections are correct. Then I have powered it with many different sources with the same result. I used a step down converter which is rated at 3amp to reduce voltage down to up to 8.4v and used power from DC 12volt 7amp lead battery or 19v laptop battery or AC converter, they all give me same result. The camera sees the battery displaying an empty battery flashing sign in display but will not power up. I even used an 18650 power pack (8.4v 8amp) directly (no step down) to the dummy battery. Same result. AC wall converter with 8.4v 2amp DC output, same result. What am I doing wrong? thanks for the help.